How the utilitarian use of needle and thread helps Southern women stitch together causes and communities for the common good. There’s a story in Ovid’s Metamorphoses in which a woman named Philomela plays a small part. In the tale, Philomela’s sister, Pronce, marries King Tereus. Queen Pronce misses Philomela so much that she begs the king to bring her back to Thrace where they live. The king agrees and travels to Athens to retrieve her. As Ovid’s tale goes, while King Tereus is in Athens, he’s overcome with lust for Philomela, and takes her into the woods and rapes her. When Philomela threatens to tell the world what King Tereus has done, he rapes her again and cuts out her tongue so she can’t speak. Philomela, though imprisoned and speechless, is determined to let her sister know of the king’s crime. So she sews the story of what he’s done to her into an elaborate tapestry and has it sent to her sister. Queen Pronce receives the tapestry and brings Philomela back to Thrace where the two exact revenge on the King. Philomela’s Greece is a long way, in both time and distance, from my grandmother’s Georgia home. But in both places, a needle and thread served as a kind of liberation. I spent the better part of my childhood at my grandmother’s house. Rarely did I show up and not find Maw bent over a sewing machine, a pin needle between her teeth, running fabric through with thread. If she wasn’t hemming pants or fixing a zipper, or sewing some elaborate Halloween costume I’d demanded, she was sitting in the corner of her couch, buried beneath skeins of colorful yarn. She’d work her crochet hook meticulously, meditatively yanking knots until they became hats, scarves, and afghans. Maw sewed and crocheted through aching wrists and sore hands, after surgery for carpal tunnel; she crocheted hats and blankets for the people in my great-grandmother’s nursing home as she was losing her own mother to dementia. She crocheted before she lost the love of her life, as a reprieve from the demands of caretaking, and the hook and yarn helped her survive the worst days after he died. She’s in the middle of crocheting when I show up to talk, and we have to move piles of yarn and crochet books to make room for me on the couch. Maw started sewing and crocheting when she was a young girl living in government apartments in Columbus, Georgia. Her mother, my great-grandmother, handmade nearly all of her clothes, and Maw learned to work a sewing machine leaning over her shoulder. Beth Ward: "Maw (Betty Poole) crocheted this red shawl for my great-grandmother, Nanny, to keep her warm in the nursing home. In the photograph, Nanny is wearing it for a nursing home beauty pageant." Maw loved those doilies as they were prettier and more delicate than anything she’d had in her own house. Much to Maw’s dismay, two weeks later, Granny Smith wanted those doilies back. It would be a decade before Maw would crochet with yarn, making afghans and clothing. Today, though, she can sew or crochet just about anything — doll’s clothes, quilted children’s books, purses, pillows. But she picked up that first spool of thread for the same reason many other women have in the decades before and since. “Because I was angry,” she says. Maw is the beneficiary of a long line of Southern women who used needles, thread, yarn, and fabric not only to make clothing and blankets and decorative objects for their families, but also to tell stories, vent frustrations, and liberate themselves from the hard lives they were living. The history of sewing and crafting is deeply gendered. For centuries, women were resigned to the domestic sphere, instructed to remain unseen outside the home. Women and girls in the 18th- and 19th-century South lived highly regulated lives. Like Philomela, they had few ways to express themselves publicly. Working with fabric, yarn, and thread, though, was considered an acceptable and non-threatening way for them to be creative, as home crafts were often dismissed as a frivolous and feminine way to keep a woman's hands occupied and her mouth quiet. Bringing beauty and God into the home was also part of a woman's job, and embroidery was another way to do that. In the northern United States, young girls from well-to-do families would attend schools where, rather than learning math or science, they took classes on decorative embroidery and sewing. Embroidery and needlework were meant to teach girls patience, piety, and obedience. They were also skills that girls were told they would need to cultivate in the very important work of acquiring a husband and taking care of a family and children. Maw combs through one of the many crochet project books she keeps at home. This manifested differently in the South, according to writer and historian Heather Palmer. Girls and women from upper middle-class Southern families may have stitched decorative handkerchiefs or samplers, too, as being able to do so was considered a social grace. But for the girls and women in non-wealthy Southern families, like Maw, my great-grandmother, and likely my great-great-grandmother before her, the work and purpose of sewing and embroidery were almost entirely utilitarian. It’s also one reason preserved, historical examples of Southern embroidery and needlework are so much harder to find than their northern counterparts. Says Palmer: “The problem with studying Southern decorative needlework is that items were meant, in most cases, for hard and frequent use,” not decoration. Much of what women made here, their families used because they had to. When I ask Maw if she ever saw her mama sew or stitch anything decorative, just to hang it on a wall, the answer comes back with a chuckle. Some Southern women were also too poor to afford the materials for decorative needlework. Those same women were also too busy — running a household, working the land they lived on, and mending the few clothes they had — to teach their daughters pretty, delicate embroidery. Historically, the sewing and needlework of Southern women served another purpose, too. For many black and white women relegated to subordinate roles, needle and thread were also used as vehicles for agitating against slavery, supporting soldiers during wartime, and forging a female-driven community where ideas could be shared and cultivated. Antebellum sewing bees allowed upper- and middle-class Southern women to contribute to war efforts by knitting and sewing socks, blankets, flags, and tents for soldiers. These sewing bees also allowed them a chance to organize, support a variety of causes, and broadened their opportunities for activism after the Civil War. These community events excluded enslaved black women, but they also found ways to use sewing as a means of liberation against oppression. Sewing and stitching were valuable skills during and after the Civil War, and some used and sold their skills to buy freedom. Some folks consider it a myth, but it’s also been said that women looking to escape slavery via the Underground Railroad communicated to each other using codes stitched into quilts that would be passed along from one set of hands to another. For all these women, a needle and thread, or a hook and yarn — believed to be little more than an avenue for teaching girls to be quiet and obedient — became a catalyst for emancipation, for consciousness raising, for community building. Deep in West Virginia’s coal country, Gina Mamone sits at night listening to vinyl records. Mamone disconnects from the phone and computer, gets still, and on any given evening, might pick up crochet needles to continue work on a granny-square afghan. On a different evening, it might be embroidery on a snapback. Every stitch, every hook of the needle, pulls the threads of Mamone’s sobriety tighter. Each purl-two reconnects to their family’s history, to the folk crafts of their homeland, and through the work of Mamone’s Queer Appalachia project, also to an Appalachian LGBTQ+ maker community that’s using needlework and fabric art to advocate for social justice and equality in a region that, most times, continues to tell them they don’t exist. The QA community includes knitters, cross-stitchers, and a huge variety of other fiber artists and activists who use needles, thread, and fabric to advocate for equality and raise awareness for issues ranging from the opioid crisis to the region’s lack of healthcare access, from police brutality to education reform and fair pay for teachers. 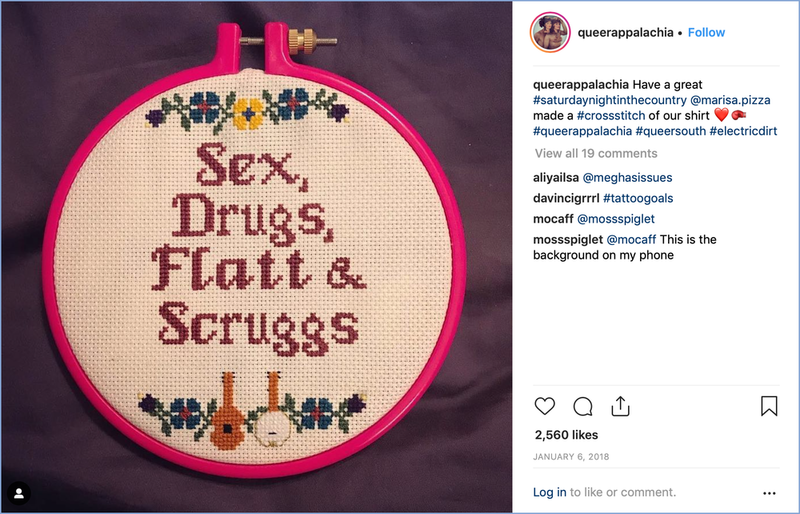 Hashtags like #ruralresistance sit underneath photographs of embroidery hoops, granny squares, and cross-stitch projects. A few of the gems from Queer Appalachia's Instagram feed. But Mamone didn’t grow up wanting to sew or embroider. They saw their grandmother do those things, but like many people, they’d dismissed fabric crafts and needlework as silly, girly pastimes reserved for housewives and old ladies, ones that they had no interest in learning. Mamone’s grandmother wasn’t unlike Maw in that while occasionally she’d embroider or sew something decorative, necessity dictated most sewing and mending. It had to. Mamone’s grandmother was born on the dirt floor of a cabin, one of 16 children. Only after moving back to West Virginia from Brooklyn, both to care for their parents and confront their issues with doctor-prescribed opioids, did Mamone realize that making something tangible — knitting or crocheting or sewing — could steady trembling hands and calm the mind. Mamone also realized, with some additional urging from a dear friend, that their grandmother’s dainty crafts might also galvanize a marginalized community in a forgotten-about place. It turns out that the “girly” crafts Mamone thought “would be a boot on my neck as a child,” have become a kind of freedom, one that not only liberated Mamone and our grandmothers, but that is also liberating a community of thousands of other women and non-binary folks in Appalachia and across the South, one stitch at a time. On a dreary, rainy Saturday in late January, some 500 miles south of Mamone’s West Virginia, the Brown Sugar Stitchers Quilt Guild gathers at the William C. Brown Library in Decatur, Georgia, for their first meeting of 2019. They’ve invited me to their biggest meeting of the year, with members from four other quilt guilds around the state coming together to show their work. The Brown Sugar Stitchers are an African American quilting guild founded by Nancy Franklin and Jocelyn Carter. The group came together with the help of beloved Dekalb County librarian Doris Wells in 2000. Franklin and Carter began the guild as a way to bring women together to quilt, form friendships, and serve the community. But it also began in part because, while there were plenty of quilting groups in the city, few included more than one or two African American women, and Franklin wanted to change that. Like Maw and Mamone, current BSS president Elisa Woods came to sewing and quilting through her mother, grandmother, and aunts. They made what she called utility quilts. “They used old clothes to make quilts that would keep us warm,” Woods tells me. When one of those quilts became too threadbare to use anymore, Woods learned how to quilt so she could recreate it. She fell in love with the art, and when, years later, the opportunity came to join BSS, she took it. Today, she quilts as a way to share love with others. Each month, the Brown Sugar Stitchers come together to work on those projects, learn new techniques, and share stories about their lives with each other. Indeed, community and public service are foundational components of the BSS guild. The Brown Sugar Stitchers sew quilts every year for the Carrie Steele-Pitts Home for Children in southwest Atlanta. They’ve also made or contributed quilts for Quilts of Valor, the Justice Project, the National Craniofacial Association, the Atlanta National Black Arts Festival, local public schools, and the Grady Breast Cancer Center. 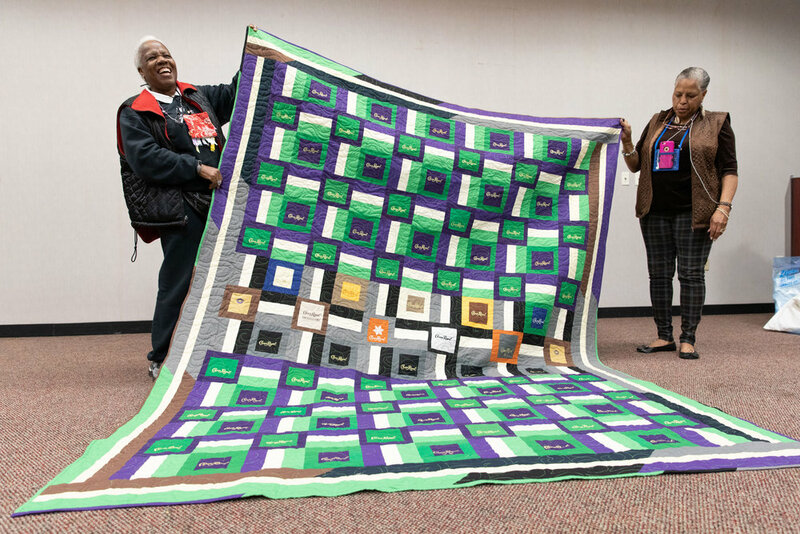 The BSS guild will celebrate 20 years together in 2020, but quilting as a craft has had deep ties to black community activism in the South for decades. Meeting of the Brown Sugar Stitchers, Atlanta, Georgia. Since the 1920s, the women quilters of isolated Gee’s Bend, Alabama, have sewn beautifully elaborate quilts that tell the stories of their families and their culture. Originally sewn out of scraps to keep warm, the quilts of Gee’s Bend are considered some of the greatest works of American art we have today. They’re displayed in exhibitions at venues like New York’s Whitney Museum and the Metropolitan Museum of Art. Annie Mae Young, who passed away in 2012, was a Gee’s Bend quilter during the Civil Rights Movement. One of her better-known quilts was fashioned out of denim and strips of corduroy work clothes. The blue denim was said to signify the American dream; the corduroy strips, prison bars. The Freedom Quilting Bee, also based in Alabama, was a quilting co-op formed in 1966 as a way for black women fabric artists to make an independent living. Many of these women were also civil-rights activists who used the quilting co-op as a way to organize and agitate for social justice. Nancy Franklin, one of the founding members of the Brown Sugar Stitchers, with her queen of spades quilt. O.V. Brantley, a past president of the Stitchers, does hand stitching in a hoop. Brantley founded the Clara Ford Foundation, whose mission is to preserve and promote African American quilting. Debra Steinmann is a member of Atlanta Intown Quilters. She came to the Brown Sugar Stitchers meeting to display two of her most recent works. Steinmann also views her sewing and stitching as an inheritance from the women in her family who came before her. Steinmann, considered a folk quilter, creates art quilts that are beautiful and decorative, but she also uses them as vehicles for political activism. One quilt she presents at the BSS meeting is stitched through with the phrase “Fear Lies.” It signifies, she says, her feelings about the way lying and fear-mongering are being used to keep people divided and afraid. She’s also quilted pieces with “Watchdog” stitched onto the fabric to raise money and awareness for organizations like Planned Parenthood. Steinmann’s latest project, which she plans to enter in a juried show at Atlanta’s Callanwolde Fine Arts Center, is called “September 27, 2018,” and is Steinmann’s commentary on the Ford/Kavanaugh Supreme Court hearings. “The political statements [in my quilts] are an extension of myself,” Steinmann says. And the avenue of quilting helps her stay connected to the quilters of her past. O.V. Brantley likes to teach hand-stitching techniques because she wants to keep the practice alive. There are many ways for Southern women to tell the truth of our lives — many of which were forged from our incredible ability to make a way out of no way, from our being determined to speak and share our stories as society told us to hush, sit still, simmer down, be polite. The stitches and knots made by the hands of Maw, Mamone, the Brown Sugar Stitchers, and the civil-rights activists of Alabama — they came together to become more than just clothes and quilts. They took their art, something originally intended to keep women subordinated and oppressed, and they used it rip open the seams of possibility for their lives and the lives of others in their community. To be without worry and fear — to be immune to the dictums and demands of others, even if only for a second, for just the time it takes to sew a hem or crochet a chain of yarn — that is a freedom, one found by many women who wield a hook or needle. Sewing and crocheting still Maw’s mind and create space for her to be something other than a mother or a grandmother or a giver or a caretaker. In the hum of a Singer sewing machine or the quiet, steady clicking of a crochet hook, she unspools the space to just be a woman, a strong, resilient, tough-as-nails woman. And that strength and love and resilience, that power, is wrapped up in every stitch, every scarf she makes.